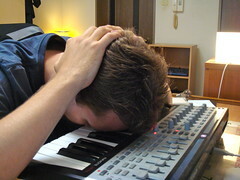 Depending on the track it might take you no more than a couple of hours to produce something that sounds decent, or it might take weeks and weeks (sometimes months, years!) of going through countless permutations of the same song, deleting complete arrangements and starting over again and again before you come up with a satisfactory result. ...and this was the point where Anders felt he'd...had enough and decided to pass the track on to me. I personally really liked the first two versions and wanted to combine them somehow, but sadly a lot of the original elements where lost due to computer trouble, so I went to work with whatever was left and began adding some new elements.